Here are 10 out-of-the-ordinary dining experiences you can enjoy. When a pop-up eatery populated by live owls was announced in London earlier this year, it attracted as much criticism as attention. Over 60,000 people applied for just 500 tickets to the launch of Annie The Owl in Soho, although protests over the owls’ welfare by animal rights campaigners led to the original event being cancelled. It eventually went ahead at a different, more spacious location, and was apparently more about conservation than food, but it did illustrate how people love a less conventional dining setting and atmosphere. There are plenty of far less controversial but offbeat options around the UK. From prison restaurants to dining in the dark, here’s a selection of our favourites. The supperclub trend – inexpensive, social dining – continues to grow, and so is the inventiveness of the venues. Take The Grub Club’s Underground Supperclub (pictured above). 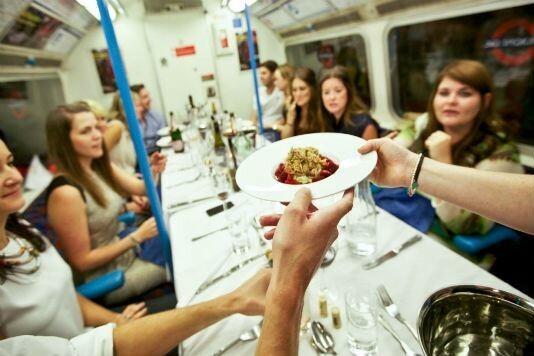 The brainchild of Alex Cooper, a graduate of Paris’s Le Cordon Bleu School, diners can enjoy his fusion cuisine on a disused 1960s Victoria Line train. Another venue is the St Pancras Clock Tower where 12 diners tuck into the dishes of Argentine chef Martín Milesi. Similarly, website Trip4Real specialises in unique activities led by locals and offbeat dining experiences include dinner in the home of a chef who trained in a Michelin-starred restaurant. The Kitty Café is Nottingham’s first cat café is also the only one in England outside London. Doubling up as a re-homing and care facility, it houses rescue cats, strays and cats with medical issues where they’re cared for by staff until they find a new home. It’s hoped punters will fall in love with a feline or two as they sip one of 100 different teas and fresh coffee or enjoy homebaked savouries and cakes. Strict rules are in place to protect the cats’ welfare. There’s something very different about The Clink restaurants – they’re part of four prisons across England and Wales. Restaurants are staffed by prisoners working towards City & Guilds NVQs in Food Service and Food Preparation, with a view to working in the hospitality industry after release. All four restaurants have been given The Sustainable Restaurant Association’s 3 Star Award. Security checks are required at HMP Brixton and HMP Sutton in Surrey but not necessary at Her Majesty’s Prison (HMP) Cardiff or HMP Styal in Wilmslow, Cheshire as restaurants are outside the main prison walls. Styal’s restaurant is staffed by women prisoners. Imagine dining in complete darkness, while being guided and served by blind people? That's what happens at Dans le Noir? in London’s Clerkenwell. Blind dining is said to “re-evaluate our perception of taste and smell”, kill shyness and provide a “human exchange, when, for once, the blind become our eyes to guide us into an intriguing new way of sensing our environment.” It’s social dining with others and a choice of menus. Diners can request to leave at any point if they find it disconcerting. Menus are seasonal but you can see sample dishes on their website. What makes The Gardener’s Cottage in Edinburgh unique is its country garden setting in the heart of Edinburgh. It really was a gardener’s cottage once upon a time, and has been restored by co-owners and chefs Dale Mailley and Edward Murray. The focus is on seasonal ingredients, local producers and social dining with guests enjoying the six-course evening menus at long communal dining tables. They also offer a-la-carte lunches and weekend brunches. This is no ordinary diner. The Wall SE1 is located inside House of Vans, London’s first indoor skate park inside the Old Vic Tunnels at Waterloo, and has been serving its own style of food and drink here since August 2014. Inspired by New York’s café and diner scene plus the worldwide street food movement, they serve brunch, burgers, beers and cocktails all against the noise, action and buzz of London’s cool skater crowd. At the Treetop Restaurant in Alnwick Garden, Northumberland trees grow through the floor, a log fire roars in the middle and you’re high up in the treetops, surrounded by walkways, rope bridges and handcrafted furniture. The restaurant has been built from sustainably sourced wood with an emphasis on locally sourced food. A new addition is The Potting Shed on the deck. It’s a great spot for cocktails which have been created by the Duchess of Northumberland, inspired by stories from the Alnwick Garden's Poison Garden, and served in old apothecary bottles. Two Rivers Restaurant is no ordinary place. It’s located inside the Endless Oceans Gallery at The Deep in Hull, one of the UK’s largest aquariums. Diners are surrounded by the sight of 3,500 fish, sharks and rays as they tuck into Mediterranean food with a Yorkshire twist. If you’re eating there, you’ll also be able to explore some of the aquarium’s exhibits. The restaurant is open on Friday and Saturday nights, and on monthly Deep Blue Thursdays, so booking ahead is recommended. Do you have any unusual dining experiences to recommend? Let us know in the Comments section below. Blind dining: just how difficult is it?